In the past, I have been feeling like this little boat, continually working my little effort, and not seeing much change. But lately, things have seemed to be moving forward. Once my little boat finally started the mass moving, it is still moving, and all the continued effort seems to be additive, and the movement is accelerating. Toot, Toot. Throw some more coal onto the fire! 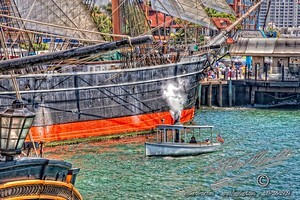 This entry was posted in Painterly, Purchasable - As Art Prints, Ships, Transportation, Water. Bookmark the permalink.